A 7.8m-tall elephant and the vocals of Gary Barlow were the sight and sound of salvation for one of the world's oldest first-class cricket clubs. 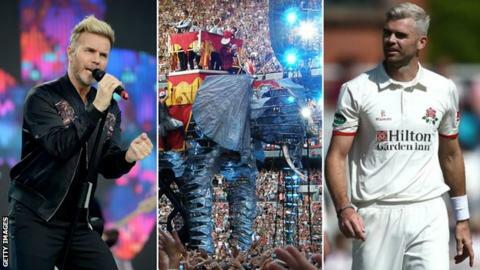 Almost a decade ago, Old Trafford hosted iconic British pop group Take That for five nights, with their Circus Tour bringing 250,000 concertgoers to the home of Lancashire County Cricket Club and delivering desperately needed income. The loss of Test match status in 2009, later coupled with the burden of trying to upgrade rundown facilities and a legal fight over the ground's development left the club on the verge of collapse. "People talk of rain in Manchester, but it really was a perfect storm. The nadir was losing Test match status in 2009," Lancashire chief executive Daniel Gidney told BBC Sport. "Without a doubt, if it wasn't for concerts this club would have disappeared." Seven years later, a first-class county almost did go under. Durham were forced to accept a £3.8m aid package from the England and Wales Cricket Board (ECB) to help manage debts in 2016. It was a deal that saw the club relegated from Division One of the County Championship, and lose the right to stage Test cricket. Tales of financial trouble, counties turning to off-field business to stay afloat, the importance of international cricket to fund the domestic game and the need for the ECB to prop up clubs are commonplace. Sports finance experts looked at the available balance sheets of the 18 first-class counties for the three years from 2014 to 2016. They found there was an "over-reliance" on income from the ECB - which is largely made of revenue generated by international cricket and broadcast deals. They discovered just one club, Glamorgan, would have made a profit without ECB income being taken into account. However, their position was improved as they had more than £11.4m of debts written off in 2015. In the cases of five counties - Middlesex, Worcestershire, Kent, Derbyshire and Leicestershire - the average ECB incomes made up more than half of their total revenue. While each of those clubs generated averages of less than £5.2m, the ECB's financial support for other clubs - such as Surrey, Warwickshire and Lancashire - made up just a fraction of their income. The study highlights that there are "isolated examples of clubs doing well" and that there is a "polarisation between the counties that host international cricket and those that don't". Dr Dan Plumley, a senior lecturer in sport business management at Sheffield Hallam University, said: "Cricket is fairly unique in this country in the sense that the ECB is one of only governing bodies that gives central grant money to the individual clubs. "But there is a reliance on that money. "It is obviously great that the ECB provides it, it is one of their remits - they are doing their job in terms of looking after the county side of the game. "But should they be looking at budgeting on the worst case scenario and look to become more sustainable as individual clubs?" In a statement, an ECB spokesperson said they "will continue to do what is best for the health of the game in the long-term". The statement continued: "That does include seeking a financial return as well as investing in our first-class counties as local centres of cricketing excellence. "Each of these will continue to play a critical role in developing talent for our national teams, building a bigger and more diverse following for all our domestic competitions and strengthening links with the wider recreational game." When Gidney started his job at Lancashire in 2012, he recalls they were "coming off the back of a four-year run of cumulative losses of £9m". Advanced sales of £4.5m for the 2013 Ashes Test helped keep them afloat that year, but that money was gone before Gidney even arrived. It was not the first time they had come perilously close to ruin. "Having Take That play here five nights in a row was worth an enormous amount of money and the club couldn't have survived without it," said Gidney of a club and venue that has staged concerts for more than two decades and which will host singer Liam Gallagher in August. "A lot of the purists perhaps don't like that fact that concerts are coming more into cricket grounds, but it became an integral part of the business model here. "Sport for 18 to 25 days a year does not pay the bills - six days a year of international cricket determined whether we lived or died in that year. When I got here, I sat with the team and said 'OK, deep breath, we have to be more than this'." Lancashire wanted to be "completely financially sustainable outside international cricket" by 2020, and Gidney says they have "pretty much" achieved that two years early. Following a 10-year, £60m ground development, which included the construction of The Point conference space and a new hotel, the club - which is again regularly hosting Test and international matches - now generates about half of its turnover from non-cricket business. "Cricket is at our heart, but we have to have business on our mind," Gidney said. "We have an engine now, a revenue monster from the conference, events and hotel side that will fund domestic cricket." While Lancashire's approach is not unique in the game - and with Surrey leading the way - Gidney says some will still "rely" on ECB income. "There are some clubs that are proactive and innovative and others that aren't and want the cheque," he said. For the next seven years, at least, that income is secure thanks to a new five-year broadcast deal worth £1.1bn running from 2020 to 2024. It is a deal heralded as a "game changer" by ECB chief executive officer Tom Harrison. And every county will be guaranteed an additional £1.3m per year from the new eight-team, city-based 100-ball competition from 2020. "It comes attached with a double-edged sword," Plumley warns. "If the TV deal allows the ECB to increase the central income to clubs then is there a danger of clubs becoming more reliant on that than ever before." Moreover, Plumley said fears about the creation of "super counties" should be taken seriously, as the financial divide between the haves - those who host Test cricket and are in line to host a franchise in the new competition - and its have-nots is already stark. "The new franchise league could starve the smaller counties of even more income and put it in the pockets of the international ground counties," said Plumley. Gidney disagrees and stressed they are "absolutely fully part of the 18-club county game". "As for the Hundred, we are a host and it's not a Lancashire team - it's owned by the ECB and we will work with them to support it. How can that mean we are suddenly a super club?" said Gidney. "In many ways the perceived threat for county clubs is the same for us as it is for Kent or Northants, and at the end of the day it is a different brand that is growing and developing in our venue." In a statement, the ECB said franchise venues, like awarding the 2023 Ashes series, were "agreed" through a major venue awards process and will help "attract the widest audience and provide the best experience". "Partnerships, involving all 18 counties, are now being built around those venues," the ECB added. "ECB is fully committed to supporting all 18 first-class counties, helping them develop sustainable long-term business plans and generating revenue which can be reinvested in all areas of the game. "The new competition reflects this, involving all the first-class counties as stakeholders, sharing revenue and building on its purpose; the growth of the whole game." While Derbyshire will not host a 100-ball franchise, the club's chief executive Simon Storey forecasts that money flowing from the tournament will be transformative, but added that no decisions about the domestic game can be taken lightly as "they will impact the future of the game". Already the new broadcast deal has allowed the club to renegotiate loans, while the £6.5m guaranteed from the new competition will help improve their playing budget to better match their rivals. Derbyshire spend in the "lower quartile" of the salary cap, which is £2.29m for 2018-19. "The critical success factor there is that the salary cap remains," said Storey. "If it remains at what it is, it will give an opportunity for cricket clubs that currently have lower budgets to start being on more of a level playing field." For Derbyshire, a club that "traditionally makes a profit of £2,000 to £3,000", the additional money will also go toward clearing debts, upgrading facilities and setting a financial base for 2025 and beyond. "They are changing times," said Storey. "If we embrace them and provide the right levels of protection to ensure the 18 counties' future, then we can look at them with real optimism." Is cricket walking a tightrope? Storey says the club is "hugely conscious" about planning for life after 2025, as it is difficult to predict what the broadcast landscape will be like then. Amazon, which started as an online retailer, have won the right to show some Premier League football matches from 2019, having also taken on elite tennis and NFL, and are an example of how the market for broadcast rights is already changing. "The prudent counties will not overstretch themselves in those years between 2020 and 2024," he said. As part of Sheffield Hallam University's study, debts in the game were analysed - total liabilities against assets - and it was found that 11 of the 18 clubs had debt ratios of more than 75%, which the study states "is cause for concern when considering financial health". Plumley said: "It's tough to say that clubs are walking a tightrope but what is clear from data, and some of the balance sheets, is there are a lot of clubs that have quite high creditors and liabilities in the context of the industry." In Derbyshire, Storey says they still face a "huge amount of work" in "navigating" the 2018 and 2019 seasons, and part of that was the renegotiation of a loan with Derby City Council. "Our focus in 2017 was to smooth that profile between the two years of famine and the five years of feast," he said. The increased income will see Derbyshire's reliance on ECB income - which amounts to 60% of the club's revenue - "go further north", says Storey. But they are continuing to strive towards being less dependent on it, having added concerts to their conference and events business, while also establishing themselves as a destination for international women's cricket. The club recently reported a surplus of more than £83,000, with turnover reaching record levels as they aim to be seen as "the model non-Test match ground". "The only way we are going to be able to increase our cricket budget to the levels that are required to compete are to continue to search out new ways of generating revenue," said Storey.